Yes you can run a generator on wood. Contains Hands ON DIY STEP By STEP Construction of a Simplified Wood Gas Generator for an engine in a Petroleum Emergency. Includes detailed, illustrated instructions for the fabrication, installation, and operation of a Biomass Gasifier plus it contains The Handbook of Biomass Gasifier Engine Systems, which gives you all the theory and background on design, testing, operation and manufacture of small-scale gasifiers. We have combined two unique works and republished them as the second book in our Hydrogen Generator Gas for Vehicles and Engines series to help fill the continuing needs for information in this needed DIY home power field. I have at least one person a week that writes to me and just whines and cries that a book or a item did not give him the information he thought he wanted. Its not enough to SHOW people, tell them the SOURCES and then show it WORKING but they do NOT want to learn and to try and to experiment ...well... they just don't want to do anything. They complain: " I can't see any trees, you told me there were trees, there are none, I see a forest, but its blocking the view of the trees you said would be there." < sigh > Look what public education and MTV has done. If this is you then please go away, click cancel and find some pretty lights and stare at them.but first, at the bottom of this page there is a PHOTO just for you lazy & stupid people who want everything given to them. What took a skilled person to control and monitor, what only worked for a few hours till it wore out, can now be controlled by a $1 computer chip and it will not wear out with stuff you can get at Home Depot. SO MUCH HAS NOT BEEN DONE SO MUCH that CAN BE DONE. Maybe it did not work back " then", in 1400, in 1700's, in 1887, in 1934 NOW it's the 21st Century. We have incredible advancements in metals, composites, power generation, computer control and modeling. This book was written in 1932 !! 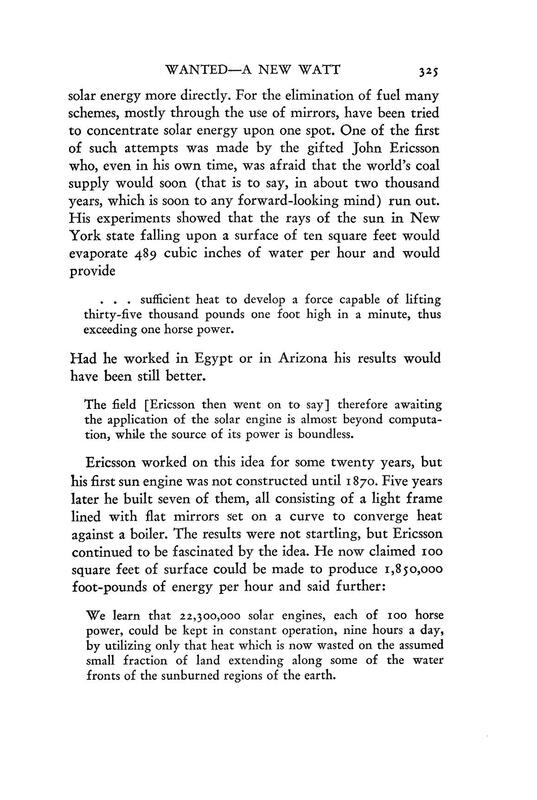 What is there about solar in 1932? Those Pages are Below. What can you learn from a book written in 1932? 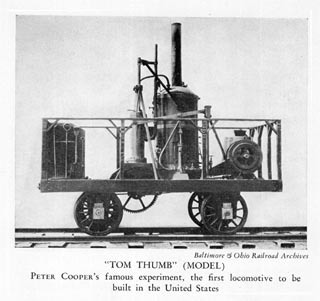 If you read the book then you'd of read about the " Tom Thumb" steam locomotive. 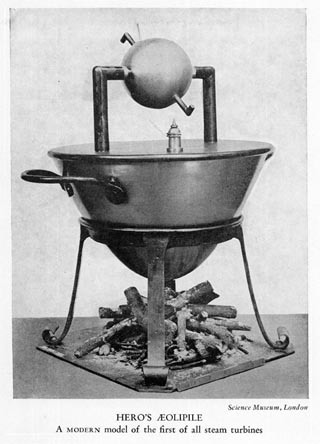 The first one to be built in the United States. Big deal right? Who cares? 1830, ancient history, what can be learned. -You would have learned that the steam locomotive weighted 10,800 lbs with coal and water and passenger car. 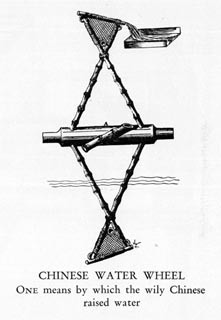 -The single cylinder was the size of a softball and just over 12 inches long. Wait..??! 10,800 lbs, 18mph on 1.5 Horse power ??! That's neat...but what does it really mean? It means that steel wheels on steel rails is a VERY efficient form of transportation. If the engine was on rubber wheels ( like your car) it would of hardly even started to roll. What KNOWLEDGE can you get from this INFORMATION. Well... lets say your city wants to put a public transportation system downtown. Or you want to invent one...who knows. What do you think would be more effecient and use less energy? A light rail system where passenger cars run on steel rails in the pavement with normal traffic, or a natural gas powered bus on rubber wheels? FYI: A 1.5 horse modern electric motor is smaller than a football. Get one for $50 on an electric chainsaw at Home Depot. p.s. If you want to know how " horse power" get invented and why? 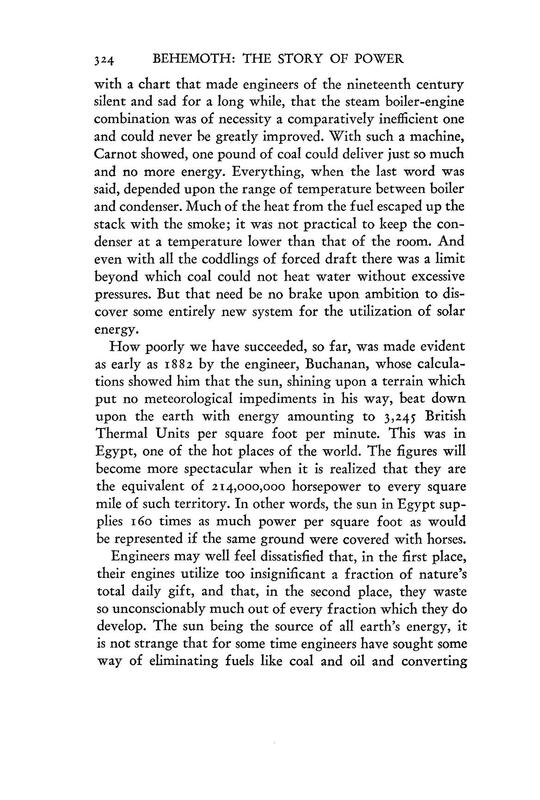 James Watt did it and you can read about it in the book. What is more powerful? 1 real horse, or 1 horse power? Its in the book. Hero of Alexandria made this 2150+ years ago. 150 years BEFORE the birth of Christ. The one in the photo is in the Science Museum in London England. The kettle is full of water. There is a fire under the kettle that turns the water into steam. The steam goes up the two pipes and into a metal sphere that rotates around the pipe. the steam exists the two bent pipe jets and spins very fast. If you have ever seen one of these in person, it is IMPRESSIVE !! Still, a very valid concept that can be utilized today in different forms. Power your cabin in the woods. Make it a cylinder rather than a sphere. Attach "rock wool' insulation around everything to keep the heat in and attach an alternator to the cylinder and crank up some power. One moving part in the steam engine. It is endless what can be done. Rotary Steam Engine - 1797.
a Mazda RX-7 go so fast ! This engine did not work very good in 1797. Why?? That's easy. first of all, the did not have good bearings. The things that make things rotate easily. At best they would have a lead or a Babbitt bearing, or a wood on wood bearing with lard as a 'grease' lubricant. The tolerances between the blades and the housing would not of been very tight and there would of been a lot of blow by. Steam getting around the blades. The interface between the side of the wheel and the case would not of been very good. Anyone in a high school machine shop, let alone a trade college machine shop, could make one of these with a vertical mill and a lathe that would fix all of these problems. It can be cast from aluminum with Kingsford charcoal and a shop back on blow in your back yard, a few old aluminum car rims and then the rough castings would be finished on the machinery. We'll put a good book out on backyard casting in the future. Get it to work and put it on ebay and sell them. Oh.. steam comes in pipe E ( on upper right ) and pushing on the blade H, moving it clockwise and then the steam escapes out pipe F ( on upper left ) and the door at the top makes the pressure differential. Business model today ! Learn from it! James Watt ( the man where we get the term WATT which is a measurement of power. ) made huge improvements to the steam engine. His was more efficient then the Newcoman engine and thus it saved mine owners a great deal of coal. 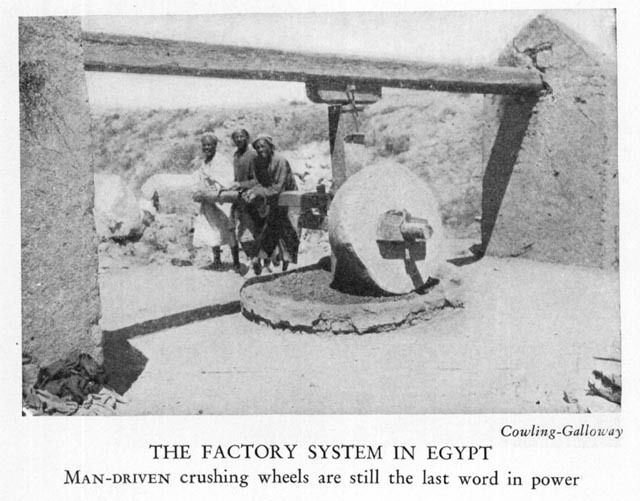 The engines were used to pump water out of the mines, which was a constant problem. The mine owners were skeptical of his new engine so he made a deal with them. He would install the engine for nothing, and the mine owners would pay him 1/3 of the money they SAVED on coal using his new engine over the previous one. This made positive cash flow for Watt pretty quickly. How does this apply to you? If you have a large source of waste vegetable oil and you want to run a diesel generator with it, and you have a local business that uses a lot of power ( like an ice plant ) or any other assortment of businesses. You can do the same thing, give him a no risk system, where you get paid on a percentage of the money he saves. What does the business have to loose and you have everything to gain. Yes. By some of the best minds ever. They knew the importance of it. Back then mirrors had to be manually tracked by hand or by very expensive custom clock movements. Today, we have tracking electronics that will do it for a few dollars. Small motors, stepper motors and computer control. What was hard then, is child's play now. The best thing is for me just to show you some of the pages, experiments and thinking at the time. If they did it Pre-1900, and in 1930, YOU CAN DO IT TODAY. Click on any page below for the FULL high resolution version of the page. I mentioned at the Start of the ad. If you do not want to learn, to understand, to better yourself. If you want everything now and you want it given to you then: SHUT UP AND GET BACK TO THE GRIND.
" getting back to the grind"
Yes, this photo is in the book as well. Along with " 1 ox power"
The book is 416 Pages ! The above is a FRACTION of the knowledge that is in this treasure of a book. If you cannot articulate and explain Hero, Papin, Savery, Newcomen, Otto, Diesel and the rest then you are not going to go far in the energy business.